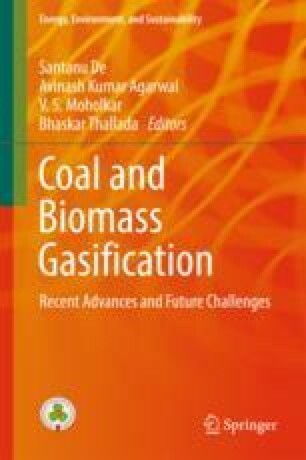 The chapter gives an overview of new techniques developed and used in coal, biomass and waste materials gasification. All of the above-mentioned materials have similar properties for hydrocarbon content. As a consequence, most of them are used for power and heat generation through gasification technology. The chapter discusses advanced kinetic as well as computational fluid dynamics (CFD) modelling schemes valid for a wide range of coal and biomass materials using a downdraft gasifier. The models show validated results with experimental data. Underground coal gasification (UCG) is also discussed, modelled and verified to some extent. Applications leading to the combined heat and power (CHP) generation from syngas produced through the gasification of such feedstocks are presented. Financial support for the research work presented in this chapter is received from the Innovate UK (132362, TS/N011686/1), Interface Food and Drink (IFD0190) and University of Glasgow KE Fund (GKE100). AMS, ANI and TS also thank, respectively, the British Embassy in Egypt and The Egyptian Cultural Affairs and Missions Sector, the Malaysian Government Majlis Amanah Rakyat (MARA) and the Ministry of Research and Higher Education (KEMENRISTEKDIKTI) Republic of Indonesia, for supporting their postgraduate research study at the University of Glasgow.